There ain’t no party like a West Coast party cause the West Coast Avengers don’t stop. Kate Bishop’s latest iteration of the California-based team attracts plenty of attention with its colorful cast of characters. Unfortunately, most of that attention comes from a newly formed West Coast Masters of Evil led by Madame Masque. In the latest issue, which garners a weekly best 57 points for 13 characters, the heroes break free from M.O.D.O.K.’s trap with the assistance of the young Hawkeye’s ex-boyfriend. 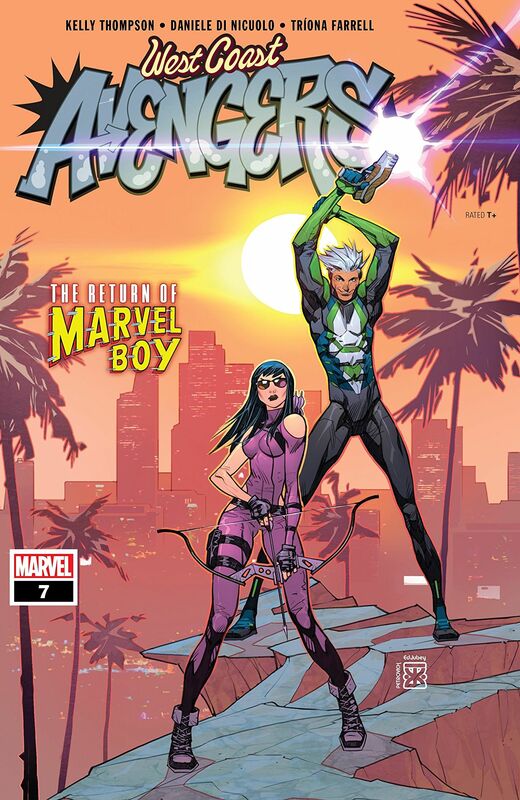 The return of Marvel Boy makes things a little awkward between Kate and Fuse, her new beau and teammate, in a book where relationships are already a big part of the story. The bromance between Spider-Man and Deadpool continues in their ongoing team-up book, but the conclusion of their trip to the Negative Zone also features the power of Karkas and Ransak’s friendship prevailing over Blastaar’s mind control trickery. By the end of the 53-point issue, Spidey and Deadpool return to their road trip and leave clean-up duties to the newly formed Negative Force team. Romance and feelings, or at least the rejection of them, seem to be front and center of the Age of X-Man as shown in the Age of X-Man Alpha book. The mutants are thrust into a world where love is scapegoated as the cause of all the world’s problems and it’s revealed that Bishop and Jean Grey have given into their feelings. The primer for the current X-event nets 45 points ends with Bishop coming under fire for his actions and sets the stage for the upcoming books in the series. A series which has Apocalypse representing the voice of compassion and love. The Marvel Knights miniseries wraps up with a 51-point book and the heroes agreeing to restore the world’s memories despite the threat of it ending the world. X-Force and Dead Man Logan are two of the other biggest titles from the week and score 37 and 36 points, respectively. For those keeping track of their own review teams, full statistics can be found in the below character reviews. Please use these results to determine your score and support us via the Fantasy Comic League’s Patreon page to become a Sanctioned Review Agent. Make sure to tweet any questions or comments to @FantasyComicLG on Twitter while using the #FantasyComicLeague tag! Key: TU – Team-Up; LT – Lead Team; SC – Save Civilian; CD – Character Development; DA – Defeat Antagonist.